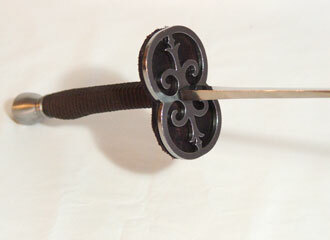 The classical French school of foil derives from the theory of small-sword fencing. In its position and movement the French school along with its footwork is subdued, discarding any superfluous movement and expenditure of physical energy. The arm in the guards and parries is not as extended as in the Italian school. All actions are executed with a minimum of force, relying on exact positioning of the body and placement of the blade. All of the fingers rest upon the almost straight grip of the foil, which is manipulated via the use of the fingers aided by a supple wrist. This permits and facilitates the cultivation of tactile sensitivity (sentiment du fer) to a much higher degree. 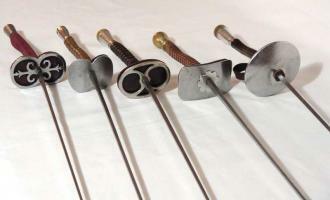 The French school is unified in its systematic and pedagogical approach to the art of fencing. Nonetheless it continued to evolve and refine its national expression of the art until the end of the classical era. We teach the Rohdes system, which is consistent with the traditional French School. The difference between the traditional French school and the Rohdes system is the manner in which Maître Rohdes organized and taught the French school. More directly, it is his specific methodology.